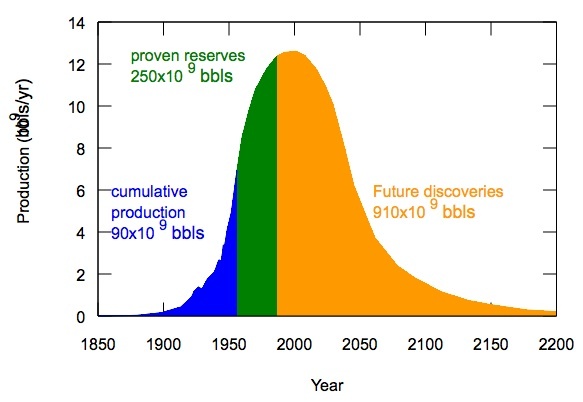 The oil experts agree that world oil production will follow a bell curve. Above is the Hubbert prediction from 1956. Beyond the peak of production, which predictions say we are now close to, although oil is still plentiful, costs start to rise. 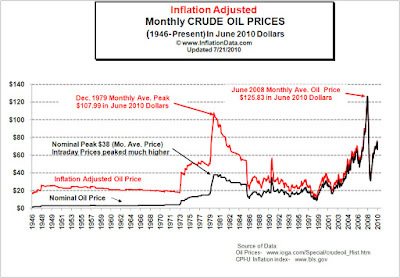 Above is a graph of inflation adjusted oil prices (1946 - 2010). The effects of two oil crises appear as perturbations on the graph. It might be tempting to think that peak oil will be nothing more than another perturbation. And yet the price history we have seen, with a year 2008 maximum followed by a recession lead slump, is only the behaviour of prices on the upslope of the Hubbert curve. The upslope is a time of increased production where economies of scale are reducing real production and distribution costs. The characteristics of the upslope of the Hubbert oil curve are the enabling of new technologies that depend on hydrocarbons. The upslope brought mechanised agriculture, car ownership, agrichemicals, plastics, mass airtravel. And a new, much larger middleclass. The nature of the 20th century is bound to the upslope of the Hubbert curve. What we don't know is what the downslope will bring. Maybe the reverse? So, can this kind of agriculture be sustained against rising prices for hydrocarbons? After the fall of the Soviet Union Cuba went through an agricultural crises. Cuban Ag crises Suddenly it found itself unable to grow food in the previous, high energy, fashion that its alliance with the Soviet Union had permitted. It had to back pedal. Currently, in Cuba, over 20% of the workforce are involved in agriculture. This amount of labour is caused by Cuba's inability to afford high energy agriculture. We might have to change the way we do agriculture and go back to labour intensive farming. Not that this is entirely a bad thing. Organic farming produces healthier, tastier food. It is less energy intensive and eliminates many agrichemicals. Moreover, fresh locally produced food is mandated when high energy transport and preservation is not possible. In Germany it is claimed that 1 in 7 of all jobs are car industry related. This is the kind of argument that has allowed the German car industry to lever about a billion euros in tax credits out of the taxpayer towards developing alternate fuelled vehicles. (BMW have just claimed the largest profits in the company's history. Free market fundamentalists may explain, if they can, why these car makers need to be given a state hand out to enable them to develop the technology to stay in business.) Never mind, it is technically possible to develop renewable energy cars. Within ten years or so, the technology for renewable energy cars, (electric or hydrogen) and as good as petroleum powered, in terms of range, performance and general reliability will likely be developed. A more interesting question is, will the market for mass volume cars still be around? If agriculture is restructured to be labour intensive somebody is going to have to be working the land. Agricultural work never was well paid. And we cannot easily go back to the farming of earlier times. Farms are much larger now, and ownership is not widely distributed. The efficiency gains of the last 60 years caused many small farms to consolidate into larger ones. The agricultural jobs of the future will be for employees, not owner occupiers. What if we go to Cuba levels of agricultural employment? Not since 1931 has 20% percent of the US labour force been employed in agriculture. The 1930s were not a time of high car ownership. The wealthy middle classes could afford them, it helped if, say you were a doctor and you needed one for work. But for an agricultural worker car ownership was totally out of the question. So where will these additional agricultural workers come from? Food will cost more which means less disposable income. This will further hit service sector jobs and the car market. Expect fewer jobs in manufacturing as well. In short, there will be no shortage of formerly well paid middle class types to work the land. But there will be some new jobs. Mass transportation systems that lend themselves to electric power will be in demand once more. Electric power, from nuclear or renewable sources will continue. Just don't expect it to get cheaper. There is so much wrapped into this. Much of the last century and a half's history has been propelled by oil. Our current culture is steeped in the stuff-- everything from textiles to plastics to how our infrastructure operates. We took oil and found every creative use for it. It has been the wonder substance that made the prosperity of the industrialized nations possible. When the cost of it increases, our social structure will have to shift. Big problem that I see coming is that the world population continues to grow while at the same time the resources needed to support our species are dwindling. And how do you convince a population to begin measures that will require adherence over several generations to make them work? Agribusiness is positioning itself to hold a monopoly on food production. Some of their actions might result in the extinction of our species. From my perspective the hope for the future lies in population control, precious seedbanks, people relearning how to eat locally and grow their own food, conservation, a total rethinking about urban planning and green zones, better developed nuclear power and alternative energies such as wind, hydroelectric and solar. 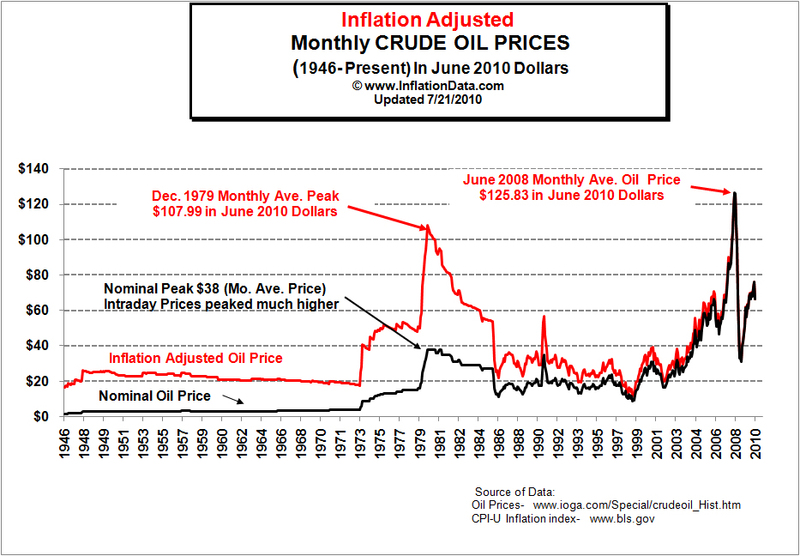 Most people seem to think peak oil is just about cars. The effect of expensive hydrocarbons on agriculture has already been experienced by the Cubans. They managed to cope with an economic structural change when their oil supplies were hit by the end of the Soviet Union. Now "Bio-fertilizers and bio-pesticides have replaced most chemicals. Today, 80% of Cuba's produce is organically"
Cuba is actually a really interesting case study and potential model. They are one of the few places on the planet not experiencing soil collapse. We are just beginning to realize that the soil itself is a huge ecosystem and in places, such as the breadbasket prairielands of the US, it extends more than 20 feet down and is incredibly complex. The continued use of petroleum based fertilizers and pesticides kills the soil and makes it "neutral" for growing specialized crops that have the characteristics that are desired, but... the soil is being killed and more and more fertilizer is continuously needed and the monocultures are incredibly vulnerable to a host of problems. Recently there was discovered a beetle that can thrive on one of the Monsanto round up ready crops that have a pesticide genetically modified into them. Selection always modifies around the GMOs. Cuba had agribusiness and then after the Soviet collapse and the US embargo they had to scramble. People starved. The society shifted. And their food production system came out better with a use of food plants that were suited to their climate, seeds from the previous year's crops, farmers understanding how to cultivate stronger and better cultivars, less dependence on oil, and healthier soil. But they suffered to get there. You are correct. Castro has been "papa" to Cuba and he saw them through this as a dictator. I don't know how the countries in the free market society will weather this one. Also I worry about countries in Africa who are being introduced to "modern" agricultural methods at the expense of traditional plant stuffs and methods being used. Are they begin set up just to move away from what they know to something unsustainable? Thanks for your further comments, Annette. I've inserted a documentary about the Cuban ag crises which I found after I'd written the first draft of this post. It took five years to rehabilitate the soil when they stopped high energy farming. Of legacies of communism the high number of scientist and the state ownership of land made the transition easier. They are proud, and justifiably so, in how they've managed the transition.